A group accused of operating as a union front shares its headquarters with one of New York City’s most powerful labor unions. Fast Food Justice, a nonprofit worker center that advocates on behalf of low wage workers, is a project of SEIU 32BJ, one of the largest labor unions on the east coast. The group’s Idealist page lists its address as 25 W 18th Street in New York City, the same address as SEIU 32BJ’s offices. The organization does not have a website; its listed address, fastfoodjustice.org, redirects to a GoDaddy advertisement to purchase the domain. Fast Food Justice is now recruiting a lead organizer to spearhead its efforts to "oversee a team of organizers and develop programs to engage thousands of fast food workers across the industry in NYC." "Fast Food Justice, a new model of worker and community empowerment, is launching operations throughout NYC," the posting says. "We have an opportunity for an experienced lead organizer to join our campaign and help build a platform for fast food workers and their communities." Union watchdogs say that the model is nothing new. The SEIU has pioneered the use of nonprofit organizing committees that are used to recruit potential members and advocate on behalf of workers outside of the scope of traditional labor law and without the approval of actual employees through an organizing campaign. The union spent more than $20 million on the Fight for $15 movement in 2016, according to its most recent federal labor filings, and successfully raised the minimum wage to $15 an hour in California, New York, and Washington, D.C., in 2016. Michael Saltsman, a spokesman at the Employment Policies Institute, a free market think tank opposed to minimum wage hikes, said that the union benefits from the lack of oversight that nonprofit worker centers enjoy. While unions are subject to federal law barring impromptu and recurring strikes and secondary strikes, worker centers routinely hold such events and organize such movements. This allows the union to pressure employers that labor laws have traditionally prohibited. "With the quiet creation of Fast Food Justice, the SEIU's secret is now out in the open. The SEIU knows that most of the restaurant workforce is uninterested in the ‘change' they're selling, so ‘cheat to win' is apparently the next best alternative," Saltsman said. The union's most successful push may not be the minimum wage hike. The union is lobbying to pass the Fast-Food Worker Empowerment Act, which would "require employers to honor workers’ requests to deduct voluntary contributions from their paycheck to a not-for-profit organization." Saltsman said that the bill is designed to siphon money out of worker paychecks and into union front group coffers. "The so-called ‘Fast-Food Worker Empowerment Act' has always been about empowering labor organizers who want a new revenue stream without the pesky inconvenience of winning a secret-ballot organizing vote," he said. 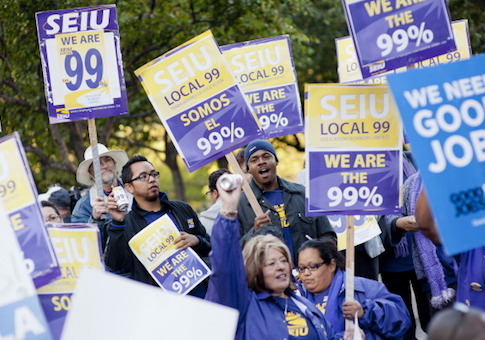 SEIU 32BJ is one of the largest and most powerful local unions in the country. Its membership has surged in recent years even as labor organizations across the country have receded. It represented 148,201 workers in 2016, an increase of 40,000 since 2009 and about double its size in 2003. The sizable increase has been lucrative with the union boasting $108 million in dues and fees in 2016—up $73 million from 2000. The union has spent much of that money on politics, shelling out $9.6 million on lobbying and political activities, according to its most recent labor filing. That spending did not take into account the spending associated with its campaign among entry-level fast food and franchise workers. The union spent $185,000 on hotel accommodations and consulting fees in association with its "fast food campaign," and also contributed $35,000 to Fast Food Justice, which was classified as a "community organization" in the report. "It’s a worker center, yes," a union official said before referring questions to the group’s spokeswoman Rachel Cohen. Cohen’s LinkedIn account says that she is a union employee, rather than a worker at Fast Food Justice. She did not return request for comment.